Chavanga Fish Blog: What you need to understand before you cast the fly . What you need to understand before you cast the fly . 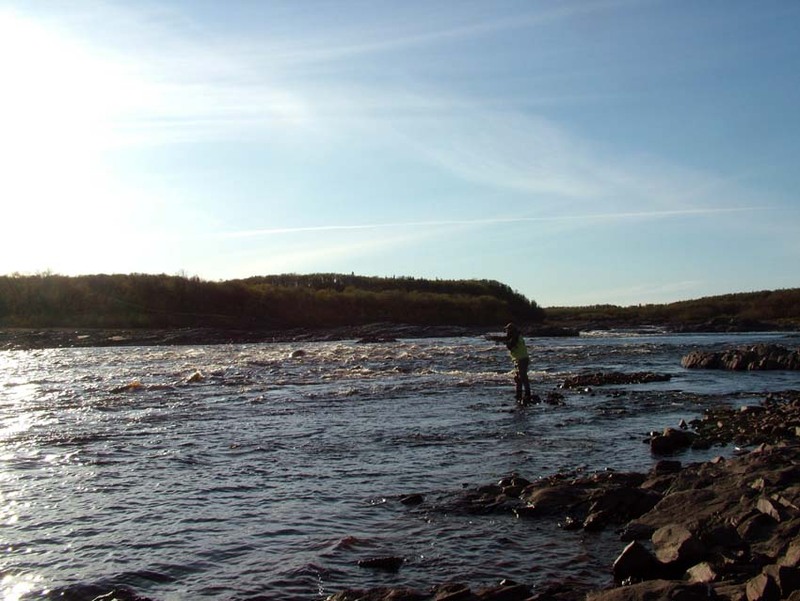 Earlier I already did attempts to organize mistakes of anglers that threw me in the eye during the 10-15 years of my work on the rivers of the Kola Peninsula. Unfortunately we can not always be appropriate to engage in a radical therapy or even surgery in the treatment or correction of mistakes and tactically wrong decisions when fishing for salmon. It happens quite difficult to explicitly state the need for change the stereotypes of fishing. It is easier to help the angler, who has not yet sustainable habits and views on how to be and how to fish salmon. Most of this lability depends on the success of fishing. So I think it is very useful short but informative article by Paddy McDonnell about the tactics of salmon fishing. You can click on the link and see the original or read it here. · In the right direction - generally obliquely across the flow, with the fly facing somewhere in the range 10 - 70 degrees to the current. Salmon are less likely to be stimulated by objects coming straight at them or heading directly away. 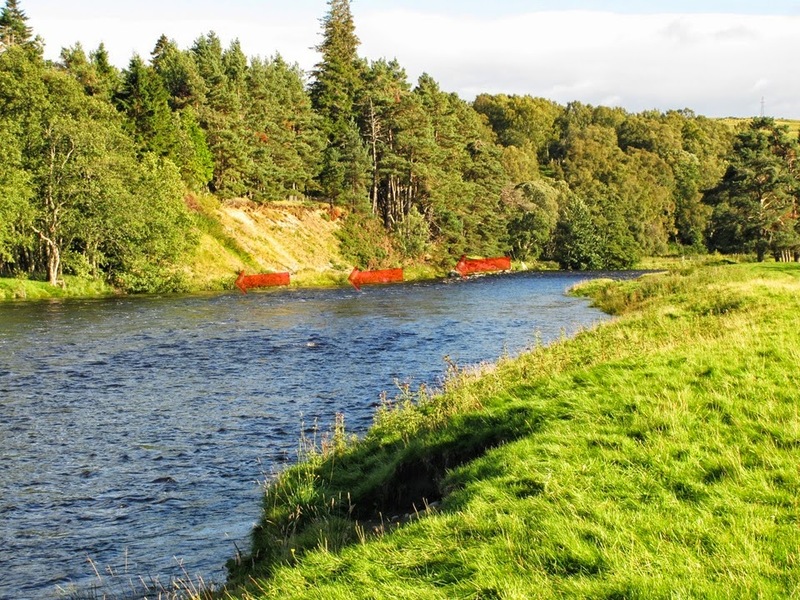 · At a sensible speed - the things the salmon's brain recognises as food - nymphs, flies on the surface and small fish - do not travel at warp speed. But if we cast without thinking, then realism goes out the window and our chances of catching a fish head the same way. Let's look at a practical example of this sin. This is the House Pool at Tomatin at +12" on a perfect day in mid-September. There are plenty of fish in the river and at this level they run freely (indeed they were when this photo was taken - we caught nearly 30 that week). They enter through rough fast water at the far left. Just out of shot to the right is shallow water that will cause them to check, pause and think, which is just what you want - nice alert fish in short halt lies. You're fishing from the bank in a grass meadow. Your natural urge is to fish all the water in front of you: after all, covering more water creates more chances, doesn't it? So off you go, determined to reach 30 yards and more, as marked by the red line. Then what happens? You put out a lovely cast to A and feel really pleased with yourself. Oh dear! The line swings round nicely until it checks in the dead water around the big rock in the middle. The nearer half of your line carries on downstream. Your fly (1) now starts to accelerate upstream, wasting the far 10 yards of the cast completely. 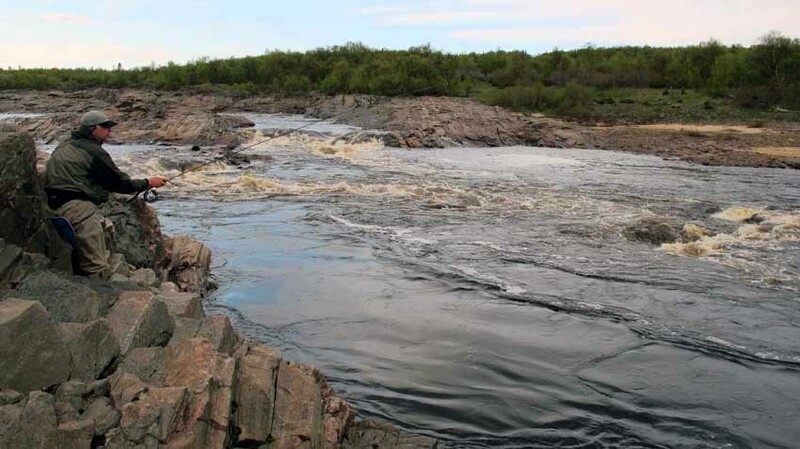 You put in an upstream mend to compensate, but as the fly passes below the rock it starts to accelerate downstream (2), wasting the middle 10 yards. By the time it's sorted itself out and you've regained control, you're almost at the dangle. Out of a 30 yard cast you've had no more than 6-8 yards of effective fly movement. Let's start again. Look at the surface of the water. You will see more movement and standing waves suggesting lies this side of the rock than beyond. 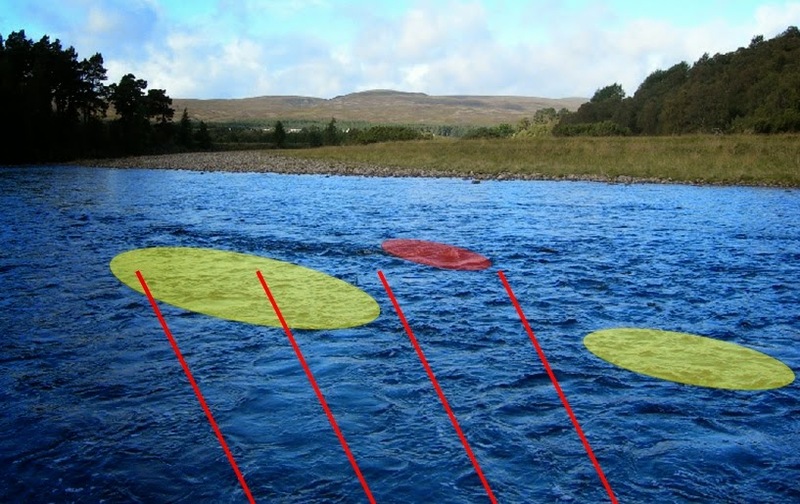 Indeed, the majority of the salmon are right in front of you: I've marked 2 good lies in yellow. A series of 12-15 yard casts will cover over 60% of the fish in this picture, with your fly under control and working effectively throughout. Mathematically that gives you 8 times greater chance of catching a fish than casting 30 yards. The bottom line is that the biggest fish taken in this pool in recent years was lying about 6-8 yards out, so please engage brain and read the water before casting! As novices our attention is magnetically drawn to the far bank. The water there unfailingly looks darker, deeper and more promising. If the far bank is lined with interesting rocks and features, the attraction grows even stronger. For men, the fact that it's a long way away makes it almost irresistible: why commit just one sin when you can do two? Or even more? So off we go, happy sinners, casting to our maximum and beyond, tempted to wade ever deeper to reach the salmon nirvana under the far bank. But despite our best efforts and the expenditure of enough testosterone to make every hen fish in the river have a hot flush, we don't get so much as a take. Our failures spur us on to even greater efforts: if we try harder, put on a stranger fly and cast more often, we shall surely succeed. Sadly, we don't. Why not? Here's a good example of a magnetic far bank, the highly productive Garden Pool at Tomatin House. The main flow runs down the far bank for most of its length, past an array of interesting boulders until it reaches the shade of the wood on the left. The water under the far bank is deeper, darker and far more attractive than the shallower clearer foreground. The middle is just plain boring. For years I assiduously cast my fly to land as close as possible to the attractions on the far side, whilst wading down a line 1/4 to 1/3 of the way across. In his long-running and outstanding Spey casting DVD, Michael Evans uses a phrase - "if you're working hard, you're working too hard". Simon Gawesworth calls it 'bashing'. If things aren't going right we tend to apply more effort and energy in the sincere belief that if we work harder, they'll come right in the end. I suppose it's a a man thing and the product of testosterone and our Anglo-Saxon work ethic: these are good things in many areas, but in salmon fishing excess effort and aggression usually leads to things getting worse, not better. The salmon are unimpressed by our exertions and cannot be beaten into submission. They take when they feel like it, not when we've earned it. Please don't confuse effort and persistence. 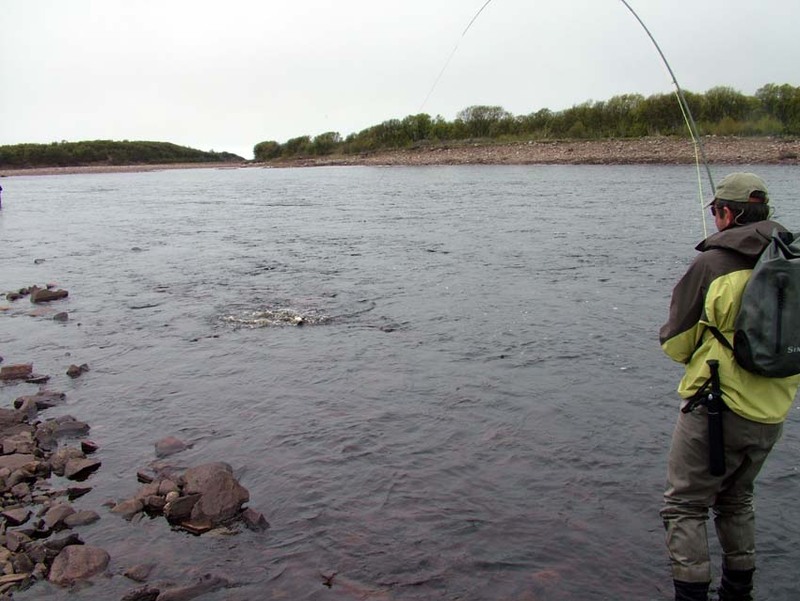 We need persistence to overcome the inevitable disappointments and frustrations of salmon fishing. It took me 4 season to catch my first Scottish fish - small, stale and weedy in the darkness of the last evening of the week in the 4th year. There were many lonely times when I felt pretty despairing about the whole thing: when contemplating the results of yet another dire cast; when trudging back to the lodge empty handed; when celebrating my friends' successes; and when paying the bills (and justifying them). But persistence is the foundation of experience, and if nothing else, in those early years I learned that muscular effort was a very poor substitute for sound technique and calm thought. Low morale is bad enough, but it sinks further and faster when combined with physical exhaustion, aches and pains. The purpose of this post is to help you avoid that condition. This article is not a casting tutorial: the written word is no substitute for properly qualified practical instruction on a river. I took lessons when I started and I still take them today in order to iron out bad habits and to improve. However, it's in casting that trying too hard is immediately apparent, happens most often and generates the most frustration. When casts persistently go wrong, your line is telling you to seek help and coaching. When they go right it adds huge pleasure to your fishing. Does your cast look something like this? The mid-section hits the water too soon; the end-section runs out of steam; and the tip collapses in a heap. I still do these, and it's usually as a result of trying too hard and applying undue physical effort. Unfortunately our immediate reaction is to try even harder and to apply more power to the forward cast, which makes things even worse. Before we do, let's stop for a moment's thought. Did we feel resistance in the forward stroke or did it feel a bit like punching air with an audible swish as the rod went forward? If you felt proper resistance, then you're not far from success, but you must take the excess muscle out of the business. You tried too hard and carried on applying power until the direction of movement of your rod tip was downwards rather than forwards. Try the following simple trick, and you may be surprised by the results. 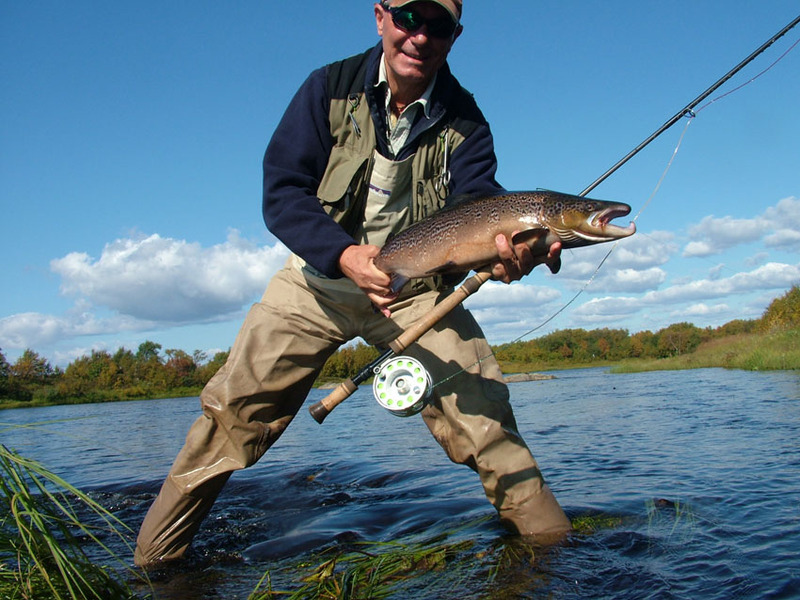 With your upper hand, hold the cork between forefinger and thumb only (if your rod is 15' I'll allow an extra finger). Now you can't welly it. Relax, look up and try a couple of casts. Behold, you'll get 80+% of your maximum range, nice and straight, because the rod has done the work, just as it ought. (With grateful thanks and acknowledgement to Jim Curry who showed me this trick in last year's brush-up session). If you were punching air, then the rods just wasn't loaded by the weight and resistance of the line. It's most likely that you were putting too much effort into the back cast and swing, which mucks up the formation of a good D-loop and leads you to break the 180 degree rule. Viewed from above it probably looked something like this. The main weight of the line is not aligned with the direction of the cast: most of it is offset by 45 degrees to the right. As a result the energy you apply doesn't load the rod: indeed, half of your effort is wasted as it always will be when the line rod and cast are misaligned. When you start the forward cast the line won't follow the movement of the rod tip towards the target. By putting too much effort into the first stage of the back cast you throw the line upstream, leaving only about 10% to form the D-loop behind you. This often happens if the fly is sunk and/or you are using a sink tip. You give a good heave to get it out and you just keep on heaving. You're in such a hurry that you cut the corner between back and forward movements, rather the correct circular track to bring the D-loop behind you. Don't try so hard: just do a nice easy downstream roll cast to bring everything up to the surface and break the water's hold on the line. Then you can make a nice smooth swing to create a well aligned D-loop. What you're looking for is more like this. You can see that the critical heavy section of the line is almost straight behind the cast direction, i.e. at 180 degrees. All of the forward motion you put into the rod transfers directly to the line. The job of the lighter bit out to the right is to stick lightly to the water when you start the forward cast, thus creating the tension that loads the rod and bends it to work like a spring. 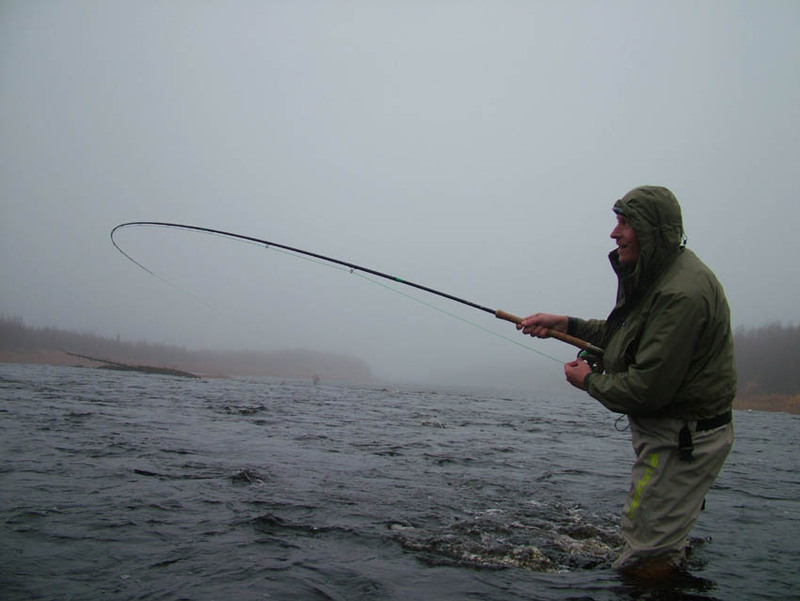 When you stop your right hand, the rod carries on straightening, throwing the weight of the line straight ahead. The whole thing of not trying too hard becomes even more important if you are using a modern short-headed line or a shooting head. Too much muscle or hurry and it flies all over the place - everywhere except into your D-loop. Just slow down, relax and look up. Why do I say 'look up'? When we're trying too hard we tend to lean forward, tense the muscles and look down at the water surface. This will always make us follow through beyond the stop point by which stage our upper/right hand is following an increasingly steep downwards curve. Try the forward cast motion using just your right hand, without a rod, and watch the track that it naturally follows past your ear. Look down and repeat; and then up and repeat. Any downward motion of the top hand in the forward cast will make the near end of the line hits the water first. Just like shooting the shot/line goes where we're looking, so if we raise our line of sight our shoulders are further back, and we'll find it easier to hold the stop on the forward cast and project the line in the desired upward trajectory. This gives it the time in the air to turn over to its full length and straighten before it reaches the water. Above all, remind yourself that the line you're trying to throw only weighs a couple of ounces, so only apply forces that are proportional to that load, and let the rod do the work. It's simple: your forward cast bends the rod by accelerating the mass of the line; you stop; and then the rod throws the line (not you!). If you're getting really frustrated and explosive, take a break: chocolate's wonderfully soothing; avoid coffee (you get even more twitchy); and remember that more than 2 units of booze will start to degrade your timing (or in my case, puts me to sleep). Salmon fishing is a rare and often expensive privilege. As a result we want to have a fly in the water every minute of the day. However, it's difficult to combine focusing on improving your casting with fishing well. Instead there is huge value in going off to a quiet stretch, early or late, where no one's watching. You're not there to fish, but to explore and learn how you, your rod and your line interact with each other. It's the same lonely solace that golfers endure to get better, but you must learn the basic principles first. Practice without principles leads to deeply embedded bad habits, whereas practice of principles leads to excellence. By the way, it's got to be on water because grass just doesn't provide the right type or level of drag. Because a fly line is not rigid it behaves in ways that don't always make sense to us (I'll spare you the maths). The Snap T or Circle Spey cast is a case in point. 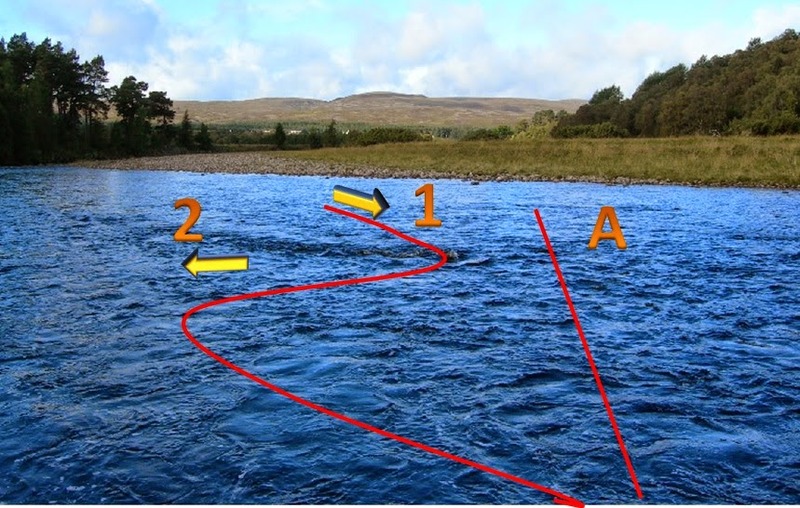 When we accelerate the top of the rod downstream, downwards and inwards to the bank, why does the tip of the line fly upstream in precisely the opposite direction? 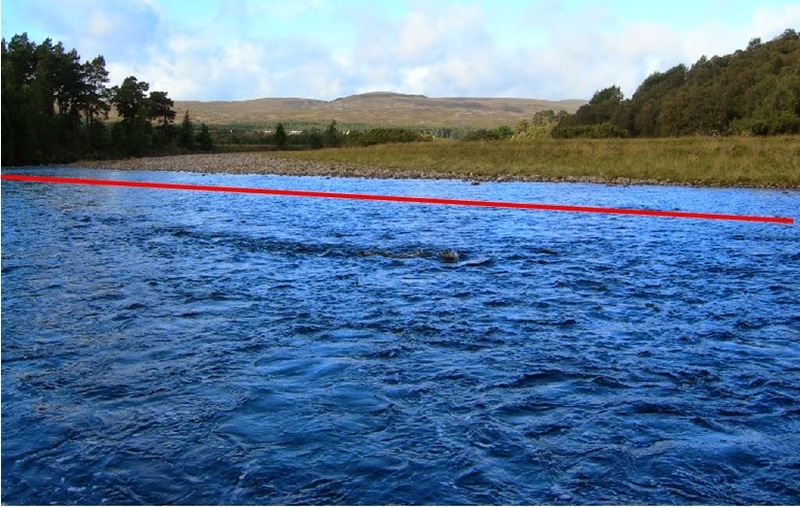 Why can you cast a lot of line off the water with a Double Spey, when even half that amount will kill a Single Spey stone dead? If getting the line up and moving back can be such a heave in a Single Spey, why does it lift so easily with a Snake Roll? With your rod and line combination, what is the critical amount of line you need behind you for a Roll cast to go airborne? So once you've found your secluded spot, explore and experiment to gain understanding of how and why the line behaves in response to different movements of the rod. Without the pressure of fishing or spectators you can break your cast down into sections, stop, look and start again. Above all, you can confirm and embed the basics: you won't be a good Spey caster until you've understood the dynamics and mastered the Roll and the Jump Roll. And whatever else you may try, don't step into the river with people watching and attempt a Snake Roll unless you've perfected it in lonely isolation. Having got in a bother with the casting we tend to transfer the same excess of force and energy to the fishing. We speed everything up. We're so keen to cast again that we strip in too quickly. We're so busy being busy and cursing ourselves that we don't look at the water and and adjust our angles, actions and tactics. How many fish do we unknowingly miss as a result? And worst of all, we commit another sin, forgetting about the fly, which is the subject of next week's sinful post.